When Gulala invited us to her house, she said “we just received nine months of our salaries, only a quarter each time. We have a council of thirty three teachers, the council organizes the peaceful demonstrations.” she said “I was threatened by Asiash then they arrested me, I was being held for 8 hours, they took away my mobile. When I received my mobile back after four days, there was a tracking device inside it, I took it out, immediately my phone stopped working.” She added “I can not sleep because the security forces (Asaish).” Teachers stood up for their rights last year, but government still remains silent. “The government isn’t listening to us, so we continue to protest for our basic rights, we care about students but government doesn’t care about them. They forced us to go teach pupils without giving us our salaries. We refused to obey to this decision, we believe teachers whose rights are denied can not provide good education for their students. The demonstrators are not just teachers, but other groups affected by the corruption in the government, they face the same problem. 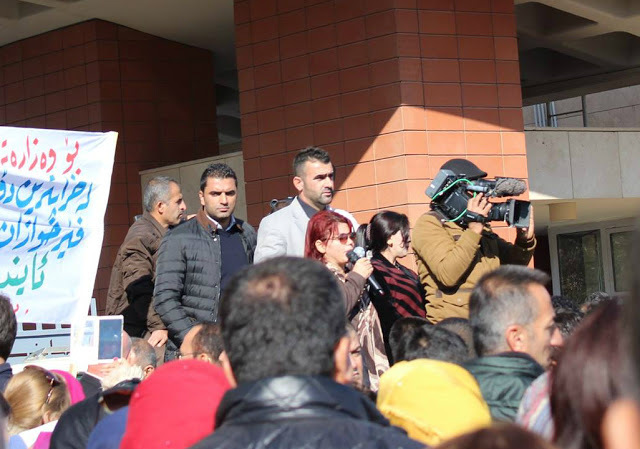 The teachers from Hawler and Duhok cities have same problems, however a political party that is running Erbil and Duhok cities did not let them express their concerns, they forced and threatened them to open schools, and to teach without receiving their salaries. When I think of their situation I see them surrounded by barbed wired fence if they try to climb out to receive their rights they get hurt if they stay they suffocate. And The only solution is getting freedom and justice back to this region. We are not going to leave, this is our home and our land it belongs to us.